From an enormous bull elephant to a tiny elephant shrew, every skull tells a story about the life, death, and evolution of vertebrates. Learn how scientists use skulls to uncover clues about life on Earth. This exhibit is no longer on view at the Academy. Explore hundreds of skulls in incredible detail on our Sketchfab channel. Before your eyes, thousands of tiny, flesh-eating beetle larvae strip a skull clean. 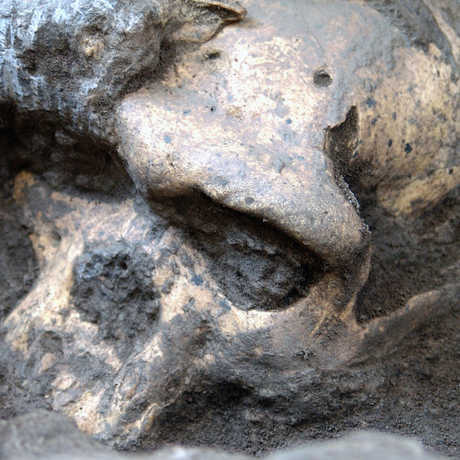 Just steps away, an ancient skull allows you to gaze 3.3 million years into humankind’s past. Behind you, two deer skulls are locked together, their entwined antlers attesting to one final, deadly battle. Before you—on a wall stretching 90 feet wide—video projections of swimming sea lions add life to more than 400 skulls. Four hundred California sea lion skulls gaze down from a 90-foot-wide wall, representing just one-sixth of the Academy’s scientific collection of this species. But be on the lookout for imposters! Peer into one of several windows to watch our dermestid beetle colony munch the dried flesh off animal bones, diligently and delicately transforming skulls into specimens. Skulls is a highly interactive experience, inviting you to touch, draw, and even reimagine your eyesight through various skulls. Experience vision as both predator and prey, try your hand at sketching skulls, and examine dozens of high-res, 3D skull images. Three sets of skulls tell the story of our species, from the chimpanzee (our closest living relative) to Australopithecus afarensis—our distant, upright-walking ancestor. Compare and contrast these specimens to find clues about our evolutionary history. Learn more about how to "read" a skull, how a wild orca becomes an Academy specimen, and how we humans evolved. 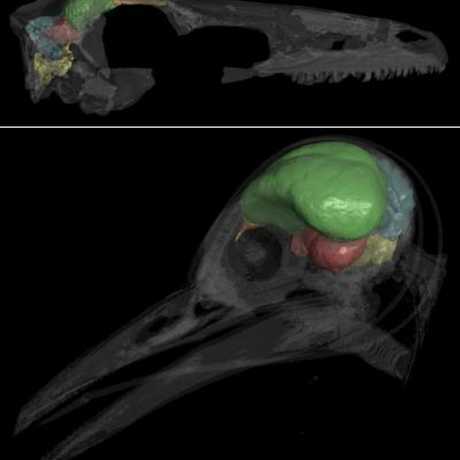 Skulls can tell stories as big as evolution, or as small as a shrew’s identity. Archaeopteryx's brain may be further evidence of its not-so-special place between dinosaurs and birds. A peek behind-the-scenes at the Academy's new Skulls exhibit.